We are not a costuming club of any sort. It’s easy to see the association in our photos with us and a famous science-fiction series out there because of the glowing sticks we’re using. Our organization is not any sort of costuming/performance club. There are many incredible Star Wars based clubs out there to begin with – but rest assured, we have nothing to do with that. Below are a list of difference that set us apart from fan-based clubs out there. – The BIG Difference: We do NOT do performances. Though we may have participated in non-paid performances in the past, we no longer do any performances in any capacity. We will conduct teaching workshops that are absent of any particular genre and are focused strictly on wellness. Any event we participate in are free and all participants are volunteers. Many of our students build friendships here that go beyond the classroom. Many folks are part of the local Renaissance Festival as well and we dress up for events like that. The idea is that our system is a means of choreographing for any type of saber/staff-related fight – genre-free. 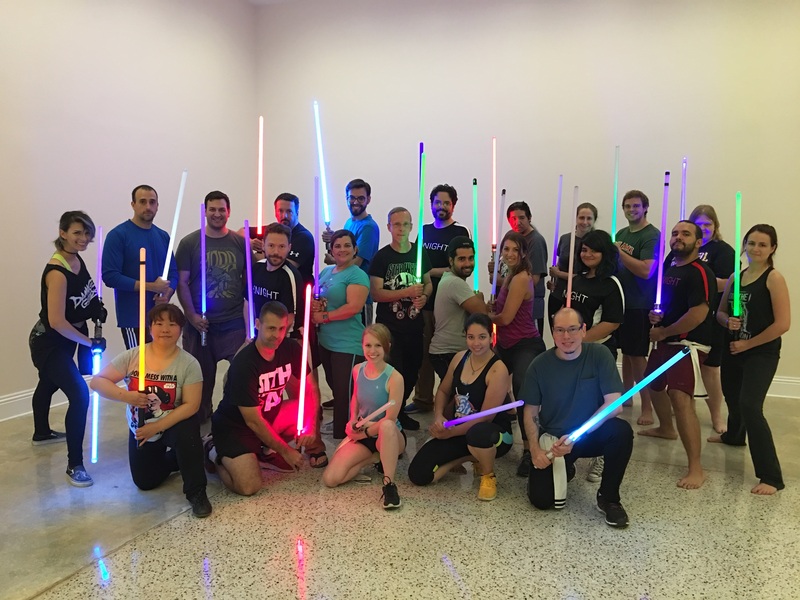 – We teach yoga, fitness and empowerment and utilize an LED stunt saber. We focus on the sport of combat choreography and do not incorporate any form of fantasy-specific genre in our competitions. – We incorporate a modern day approach to the 8 Limbs of Yoga (all of them – not just the postures) into the training and to how we conduct class. We’re not just talking about stretching or doing Downward Dog. Essentially we’re talking about the a modern approach to the Restraints, the Observations and everything that leads to Yoga/Union. Lead instruction is provided by a Yoga Alliance certified RYT 200 Yoga Instructor. – We use a combat choreography system focused on making the fight like a dance of saber play. We utilize the Temporal Choreography System and expand on it by utilizing patterns and forms of various martial arts. Some have their own target system that’s focused on hitting your opponent. Our combat choreography system is built to choreograph fights. Our form is not meant to hit someone but rather make it look like you’re trying to hit them. – We love costuming outside of class as our personal interests but our focus is clashing LED sabers and making it look and feel incredible. If you happen to love cosplay or larping and would like to gain a skill that you can incorporate with your cosplay then we have what you are looking for. We do not allow costumes in class in any capacity but rather request that you wear sport/fitness apparel. – We incorporate guided Meditation into our practice. – We have a form of sparring in the upper ranks but they are non-armoured and are specifically focused on forms. – Documentation. All our lessons and various screen fights are notated so once you understand the notation, you can learn the choreographies. – Our classes have lessons plans and there is a curriculum. In other words, you’re NOT coming to a class and learning something random…..ever. Every class ties into every class, there is a curriculum built out and we approach topics seasonally. – We run various levels of class simultaneously (broken-out) rather than everyone learning the same lesson. – We meet regularly at set times (Saturdays at 10am). Rain or shine as we meet indoors. – We charge for classes because our operation is conducted indoors in an air conditioned, safe environment and requires a stellar sound system as many choreographies have audio associated with them. We do NOT meet in parks unless it’s an informal gathering. – We end every class with an “immersive experience” that must be conducted in a controlled environment. Can you learn how to fight with a saber similar to what you may see in the movies? Of course you can! But the system is not built on any genre terms that you’ll find in other clubs like “Dulon” or “Makashi” or other words that are tied to the SW universe. Everything’s in English. We are not associated to any film series or genre. Our system is self-built from the ground-up. It’s about being YOU. It’s about a Saturday afternoon, hanging out with friends, taking time to meditate with each other, learn a lesson, move together, enter into a dance and channel that into acting, movement and mindfulness. These classes are to teach how to use a prop and build a system of integrated movement choreographies. What does that mean? That means 30 people in a room swinging sticks and nobody getting hurt. We have a different approach to fitness and well-being. Here, the LED stunt saber lights the way in our path to health in both body and mind. Still not sure? Read more about why this is the class for you. To learn more about us, visit us at one of our Fundamentals classes.